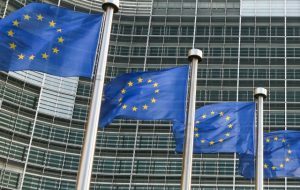 Activities related to the implementation of operational program Environment 2014-2020 have started before the official approval by the European Commission. The first step was made on Wednesday with the signing of the preliminary agreement on the implementation of activities under a project aimed at supporting the efficiency, governance, and investment planning of the water supply and sewerage sector. The preliminary agreement was signed by Regional Development Minister Lilyana Pavlova and Environment Minister Ivelina Vasileva, according to reports of Capital Daily. The step will allow the launch of three key activities under the project worth a total of BGN 38.5 M.
A total of BGN 35 M is to go to the development of regional pre-investment studies, which are to speed up the investment process after the selection of projects in the water supply and sewerage sector to be financed under the program. The preliminary agreement is expected to allow the launch of public procurement for the selection of contractors for the regional pre-investment studies and the announcement of the EU funding application forms before the final approval of the operational program by the European Commission, which is due shortly. Vasileva declared Wednesday that Bulgaria’s operational program Environment 2014-2020 was expected to be given the green light by Brussels in a few days’ time. She explained that the 2014-2020 edition of the operational program had a budget of BGN 3.5 B, with BGN 2.339 B of the total to go to investments in the water supply and sewerage sector.